Phil Shook, a Texas native, is the author of Flyfisher’s Guide to Mexico. A nationally known flyfishing writer and instructor, he first traveled to Mexico as a boy with his family in the 1950s. He recalls the thrill of seeing flights of parrots overhead as the family made its way down a jungle road and across a remote river to a beach hotel at San Blas on the Pacific Coast. Phil Shook has traveled and fished extensively throughout Mexico. Phil considers the three giant estuaries off Highway 307 in Quintana Roo some of the best flats fishing in Mexico. Ascension, Espirtu and Chetumal will definiely have you on the hunt for your grand slam. A few years later at the age of 15, he made another long driving trip into Mexico with his father in a 1956 Chevy Cameo Carrier pick-up. This time they took along a Penn Yann skiff in the truck bed so they could sample the fishing at a number of coastal stops from Guaymas to Mazatlan. In more recent years he has had the opportunity as an angling writer to visit and write about some of the best lodges and meet many of the best fleet operations, outfitters, guides, and captains in Mexico. This includes remote lodges on the giant bays of Quintana Roo in the Yucatan, bluewater grounds out of Isla Mujeres and Cozumel, long range trips out of Cabo San Lucas and adventures with panga captains off La Paz and the East Cape in the Sea of Cortez. Shook’s angling and travel stories have appeared in Field and Stream, Outdoor Life, Flyfishing in Saltwaters, Fly Tyer, Fly Rod and Reel, American Angler, Fly Fisherman, Saltwater Sportsman and other magazines. 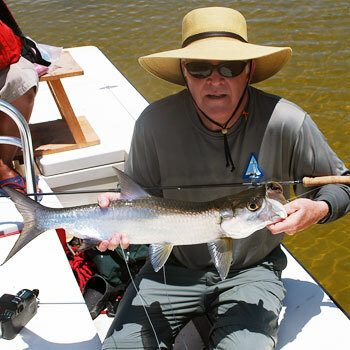 He is the author of four fly fishing guidebooks including his most recent Flyfisher’s Guide to Mexico. His outdoor writing, angling and travel assignments have taken him from Cape Cod, MA to Cabo San Lucas, Mexico and from Hudson Bay, Manitoba to Caracas, Venezuela. He is also the author of Flyfisher's Guide to the Northeast Coast, Flyfisher's Guide to Texas and co-author of Fly Fishing the Texas Coast: Backcountry Flats to Bluewater. He has received the Arnold Gingrich Memorial Award and the Silver King Award from the International Federation of Fly Fishers (IFFF) for contributions to the literature of fly fishing. He is a member of the Outdoor Writers Association of America and a past director of the Texas Outdoor Writers Association and the Southeastern Outdoor Press Association. He is an active volunteer with Project Healing Waters Flyfishing.